They agree tomorrow doesn’t necessarily have to be a double eviction all they know is tomorrow will have a HOH competition. Bruno says if he wins HOH his nominations speech will crush them (Diapers) Godfrey mentions how he wants Bruno to win just to hear it. They talk about the dates Godfrey reminds him they have no idea what the competition is going to be. they agree Bobby really knows his dates they’ve been quizzing him and he’s got it on lock. 9:55pm The Diapers are in the kitchen talking about double dates etc.. The rest are in the bedroom chitchatting.. Looks like Bobby/Brittnee’s handmance is progressing. 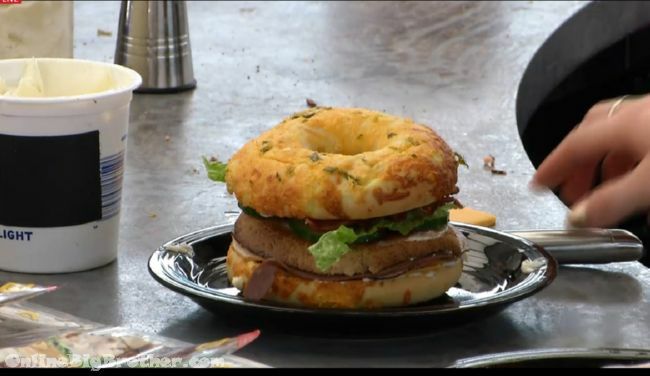 10:04pm Zach is constructing a massive sandwich for him and Ashleigh. Trying to figure out what the HOH competition is. Sarah doesn’t think the HOH will be a mental one. They complain they’ll need to stay up until midnight for Zach’s Birthday. 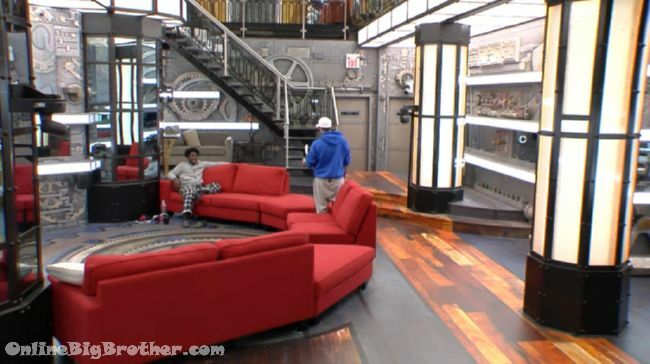 Sarah says F*** Big Brother calls her out tells her to watch her language. Willow joins them cuddles up to Sarah. They agree Zach/AShleigh are the showmance they have to watch out for. They have to knock Zach out first. They think Kevin is targeting Brittnee and Sarah. Bruno says if they can get rid of Ashleigh and Zach Kevin will crawl to them. Bruno says they’ll use whatever showmance is remaining. They trust Willow and Sarah. bruno – everyone is playing smart right now they’re playing both sides and whatever side wins that is where they are going to. Bruno says if Kevin wins they’ll have to try and get in his ear tell him Zach’s been gunning for him all this time. Or they can lay low and wait to see if their names are being thrown out there then go talk to him. Bruno – I’m going to bring up the cobras..
Bruno adds when ASheligh went up to Godfrey and asked him why he never talked to her for a vote and his reply was there’s no point cause she’s with Zach and Zach was voting against him. Ashleigh took offense said she’s her won person in the game. Bruno – AS soon as I heard that I knew there was a kink in that armor. Bruno – Play on that bud open up that wound she’ll turn on him. Bruno – you want to be known as that sucker that got used in this game. Kevin and Zach are saying this years cast is much better looking than the last two Seasons. They have a debate weather or not Jordan was lying about his age. Some of them thought he was older but the majority agreed with his age. Willow says Kevin asked her to be in a shomance with him. So I see despite people’s complaints BB is not gonna do anything about Sarah breaking the have nots rules. I am sure in the next week or 2 she will magically find a power and somehow end up in F2. Production gave her the booze. THEY GAVE IT TO HER. They can’t punish her when they were the ones who gave her the wine. I gotta say Sambooooodee, that I have yet to agree with any of your comments, but I love reading them. I don’t think anyone gets more dislikes than you, and I like that you don’t care 1 bit! You are not alone. My preference for eviction order would be Zach, then Kevin, and then Bobby. I will be incredibly disappointed if any of them make it to the end of the game. Kevin has really changed a lot. I found him so funny in the beginning, but now he just gives off this creepy vibe. Which begs the question of what is making him slip? He was so successful putting on this illusion at first, but now it’s slowly fading away, and you see glimpses of the real Kevin. Why am I not surprised that he tried to hook up with Ash, Willow, and Sarah? I really want to believe that Godfrey’s comment will change how Ashley plays the game, but it won’t. As a big brother fan, it is so incredibly frustrating watching these houseguests play the game. A houseguest really only takes action after he or she has been nominated. Big Brother is a 24 hour game. You need to eat, breathe and sleep this game. While you are napping, people are scheming. While you are snacking, someone is throwing you under the bus. You really need to be proactive if you want to make it to the end of the game. I could not agree more my friend. 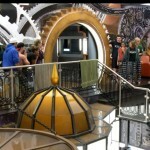 If I was in the BB house, I would be talking to all the HG like clockwork. I’ll build interpersonal relationships, trust, and talk game after observing who’s with who so I know what to say to who. You can never send your game on autopilot. It’s game over if you do. So your saying you’d play like Sarah is. What about Godfrey’s initial napping strategy? Then he was put on the block, and the sleeping beauty awoke to capture our hearts with his rousing speeches! Does anyone know how tomorrow is gonna work? Are 3 people still going home? Come on God, set those scumbags Kevin and Zach free tomorrow, yo, bro!!!! It’s gonna be another long week for the Zach-haters, I can feel it! Don’t think tomorrow is the double it would have been announced for ratings. It’s going to get good no matter what the big boys are playing do the girls are sitting pretty so far. Hate ash and pilli, did nothing but go with boys can’t wait till they are put up. All the other girls played the game. Sara my fav!!! Zach and Kevin say this seasons cast is better looking than season 1 or 2?!?! They must be wearing beer goggles!!! Come on! you have to admit that they look way better than the casts of season 2! season 1 had some good looking cast… but season 2 just had a lot fugly players in the mix. Every year each cast thinks they’re the hottest, funniest and most entertaining. So wait, Brubby aren’t targetting Zach and Kevin but Ash? When did Sarah tell Bobby/Bruno about the Purple Cobras? (What day approx, or after which event?) I missed that and I would really like to see the live feed footage. I’m kind of confused bc right after the blindside vote, it seemed like Bobby and Bruno would not really work with Sarah and B (saying that the vote “was a one time thing”), whereas now they are in tight with them, Willow and Godfrey (They are even calling themselves an alliance). I feel like I missed some vital conversations in the past week if someone could help me out! Also, Simon, does that side of the house know that the showmances call each other The Diapers? Or are you just writing in “the Diapers” whenever they talk about targeting the showmances?